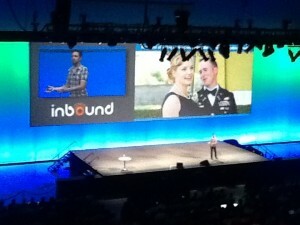 I'm live blogging from Inbound 2012, currently watching a presentation by Rand Fishkin. Rand is a well-known SEO expert and Inbound marketer. He's also the founder of SEOMoz. So, what are the biases? Click through rate is influenced by a lot more than ranking position. Take away the irrational position that ranking is all that matters because it is not. Simple things can influence click through rates like ratings and using author photo. Great snippets for meta description also heavily influence the click through rate. Rand recommends spending time crafting the meta-description. Video XML sitemaps are also good for CTR. Rich snippets (schema.org) help as well. Rand believes this is a natural bias. Instead, he suggests earning links because the best links build themselves. We can be authentic and still do SEO. Link building is best done by building relationships through great content. "If I want to rank well, I need to exclusively talk about one topic." This is a myth left-over from the early 2000's. Talk about anything that has potential overlap with the interests of your audience. This vastly expands where you can go with your content. This is a great way to expand the ability to get new leads. It also creates a rising tide for links and domain authority. This is a media created bias. We read and hear about these two networks more than others but there are many others out there. Rand is finding that Google+ has a greater click through rate for his posts although he has fewer followers on Google+. There is a long-tail of social networks that drive activity for SEOMoz. Bias #5: If a viral content effort fails, it's over! The irrational bias comes into play when someone tries to share content virally with limited exposure, then says "It didn't work! We're doing something else." Viral content can be released multiple times, even at the same url. Rand tells us about a free guide that SEOMoz released 4 times over 6 years at the same url. It took 3 times to take the top position. SEOMoz continued to improve and update the content to increase value over those 6 years. Nobody can predict viral. Try again to increase reach. This is interesting...Rand mentions that competitiveness of keywords reported in tools often correlates to Adwords and not necessarily how hard it is to rank. He suggests doing keyword research. However, he also mentions the value of the long-tail keyword. 18% of searches on Google each day have never been performed before. That's a huge amount of searches given the number of searches conducted on Google daily. As we know, buyers using long-tail keywords for search are searching more specifically and are often closer to buying. SEO can be done on other sites too when we submit content. For instance, optimizing YouTube, Quora or Slideshare content for keyword variations. Bias #8: Social sharing is "fire once and forget it"
Sharing it multiple times increases exposure. Also, look to see when followers are online using followerwonk. When posts stand out more, they get more clicks. Meta-descriptions are also helpful for social because networks pull the title and meta-description when links are shared. Uploading graphics also helps get attention instead of just using the auto-snippet. Simply not true. We can see this by seeing videos in Google's search results. Many forms of content work well. Be creative in presenting content. If you have these links, where would you rank? You might, if you're lucky, rank similarly...not better. Think broader. It's the links your competitor cannot get that will be most valuable. There are things that cost money that earn you links. Think broader. Job ads, press releases worth mentioning, sponsorships and more. Increasing site speed increased traffic and ROI in sales for REI. Google also started indexing more pages because it was faster so long-tail keyword rankings increased. Apply fixes to pages reported in website errors. By fixing these, we make more content accessible by search engines. Retargeting also helps increase traffic and one of the highest converting channels for SEOMoz (12%-15%). What irrational biases have you found?